This week we are trying out something a little bit different. January days can sometimes feel a bit dull, but not for us here at Oliveology. On the contrary, they often inspire us to think outside the box, add more colours and flavours to our weekly cooking routine. Cooking after all should be more about creativity and less about routine, right? So what are we making? 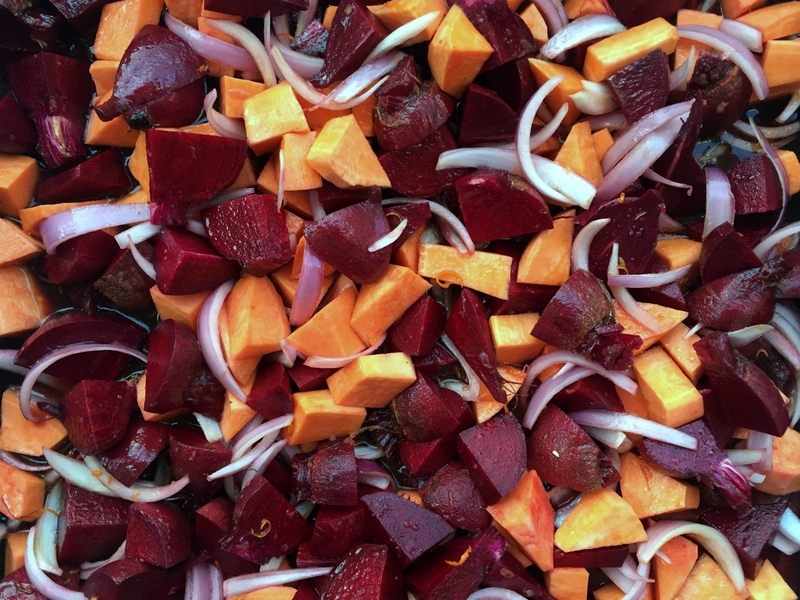 To begin with, we selected two of our favourite winter vegetables, beetroot and sweet potato. Remember our beetroot dip or our lentil and sweet potato vegan soup? This dish is vegetarian too, you guessed it right. But these are no ordinary roasted vegetables. Inspired by the Greek cooking magazine Gastronomos, we are making them sweet and a little bit sour. We will use honey to bring out the vegetables’ natural sweetness, and balsamic vinegar to add a very welcome acidic note. And the ingredients that bring everything together: oranges and grapefruits! Oh, and did we mention that apart from spending a bit of time preparing your vegetables, this recipe needs nothing more? That’s what we call an easy January dinner! Peel the sweet potato and scrub the beetroot. Cut in small bite sized pieces (vegetables will cook faster this way). Peel and finely slice the onion. Place your vegetables in a large baking tray. Add the citrus juices and zest. In a small saucepan add the honey and warm it up to make it more runny. Remove from the hear and add the vinegar and olive oil. Pour over the vegetables. Season well with salt and toss everything together so that the vegetables are coated with the honey-vinegar mixture and citrus juices. Bake for an hour or until the vegetables are soft, sticky and slightly caramelised. This entry was posted in Recipes and tagged honey, vinegar.